The day before Iran went to the polls, Mir-Hossein Mousavi, the leading reform candidate, agreed to talk to TIME magazine. The interview was held in a building that Mousavi, an architect and artist, designed himself, part of an art school and gallery complex in central Tehran. Mousavi  who is not overwhelmingly charismatic, but seems every bit the artist-intellectual  strolled into a bare conference room, with little security and only a few aides, dressed in a dark suit and blue-striped shirt. He seemed to understand the questions posed in English, but he answered in Farsi. Mousavi has a reputation for being soft-spoken, but that is an exaggeration. He is whisper-spoken. His answers to our questions were cautious, precise, although surprisingly candid at times. He was most emphatic when we asked about the way Mahmoud Ahmadinejad conducted his campaign, which included a direct attack on Mousavi's wife, the famous artist and activist Zahra Rahnavard. "I think he went beyond our societal norms, and that is why he created a current against himself," Mousavi said. "In our country, they don't insult a man's wife [to] his face. It is also not expected of a President to tend to such small details." He also criticized, as he did during the campaign, Ahmadinejad's incendiary rhetoric on international issues like Israel and the Holocaust: "In our foreign policy we have confused fundamental issues ... that are in our national interest with sensationalism that is more of domestic use." Mousavi was unexpectedly candid about his willingness to negotiate the nature of Iran's nuclear program. He said there were two issues: peaceful nuclear uses, which was Iran's right under the Nuclear Non-Proliferation Treaty, and possible weaponization. "Personally, I view this second part, which is both technical and political, as negotiable," he said. "[But] we will not accept our country being deprived of the right to [peaceful] nuclear energy." As President, Mousavi wouldn't have nearly the power that the Supreme Leader, Ayatullah Ali Khamenei, does, especially in the areas of foreign and national-security policy. But he did express a belief that the remarkable street demonstrations of the past week would basically change the nature of the power structure  in effect, forcing the Supreme Leader to pay more attention to public opinion. We asked what would happen if he lost. "Change has already started," he said. "Only part of this change is about winning in the elections. The other part will continue, and there is no going back." TIME: You were part of the revolution. How do you think the country has developed since then, and how would Imam Khomeini [the founder of the revolution] see all these developments? 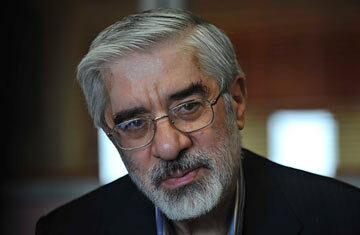 Mousavi: Imam Khomeini always welcomed change. He usually accepted changes and then tried to manage them. Have the developments in this country surprised you, and are they what you expected at the time of the revolution? These are both fundamental internal and international changes. But because some of these changes were repressed, they have now appeared somewhat suddenly. Did you expect them to happen so suddenly? I said in my first lecture at Tehran University that people are Janus-faced. They can have this duality. They both respect revolutionary values and look forward to modern changes. If you look at Vali Asr [Tehran's longest and most famous street], from all the way north to the south, there are people from all sorts of backgrounds and with all sorts of different dress codes and outfits, but they're able to gather together for one cause. Which side of this Janus face would you say is more prominent currently in Iran? This face currently exhibits an oppositional stance. If it is embraced, it can lead to good opportunities for our country. If it is rejected, it could turn into a threat. Have you been surprised by the kind of campaign President Ahmadinejad has conducted against you and your wife, and what's your explanation for his behavior? He has a particular [style], but I didn't think he would go this far. I think he went beyond our societal norms, and that is why he created a current against himself. In our country, they don't insult a man's wife [to] his face. It is also not expected of a President to tend to such small details. It is also expected that he speak based on statistics and numbers. See pictures of Iran's elections.